Cast: Tom Cruise, Cobie Smulders, Danika Yarosh, Patrick Heusinger. Visiting Washington to meet Major Susan Turner, Jack Reacher comes to know that she has been accused of espionage. Convinced of Susan's innocence, Reacher senses a bigger conspiracy. He also finds out that there's a case for child support filed against him by a woman he doesn't seem to recall. Tom Cruise returns as Jack Reacher in this sequel to Jack Reacher (2012), the movie that introduced the titular character. While not a blockbuster of Mission Impossible proportions, the original movie earned enough to merit a sequel, and of course there's enough material to have multiple movies (author Lee Child has penned multiple novels, novellas and short stories on the character). Having gone to see the original movie with little expectations, I came out a fan; so when the sequel was announced, I was hoping that I would love this one too. Unfortunately, Jack Reacher : Never Go Back falls short of the expectations. The plot is wafer thin, which is understandable given the genre, but when the twists & turns and even the onscreen dialogues can be seen coming, you know that the makers should have been put in more effort. A major reason why the 2012 movie worked was because of the raw action scenes and witty lines, for some unfathomable reason the sequel has these elements considerably toned down. 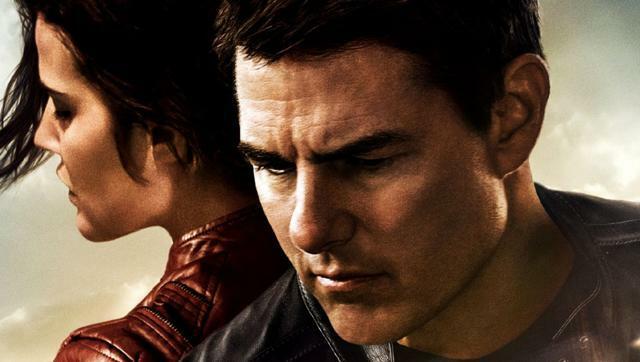 There's also an attempt to make Jack Reacher more human, forced to work with a partner and look after a teenager who may-or-may-not-be his daughter, Reacher is almost a family man in a 'We're the Millers' kind of way. There is a scene where Reacher realises that he is being followed (so what's new? ), and in a shady alley he comes face to face with four adversaries. The scene is highly reminiscent of the bar scene of the earlier movie and has as much potential, but the writing and the action make it very ordinary. There's chemistry between Smulders and Cruise, and scope for potential romance, but it's not fully explored. The movie does have its moments, but they are too few and far in between, and none of them makes the impact that you would expect. Danika Yarosh is irritating and unconvincing, while Cobie 'Robin' Smulders keeps up with Tom Cruise in action scenes and in terms of screen time - Marvel has definitely underutilized her talent. Tom Cruise does his bit; he has time and again pulled off characters without seemingly fitting the bill, and Jack Reacher is probably the best example. The character, as described in the book possesses a large physique, is built like a tank, and towers at 6 feet 5 inches tall. Needless to say, this description suits Dolph Lundgren more than Tom Cruise. Yet Cruise sinks his teeth into the role and makes it his own, he becomes Jack Reacher. Jack Reacher : Never Go Back is not a bad movie, far from it, but it's not as good as it could have been. P.S. : Here's the bar scene from the first movie. This, in short, is who Jack Reacher is.